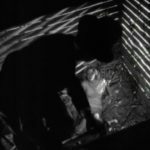 This post was written for the Chaney Blogathon, co-hosted by Movies Silently and The Last Drive In, November 15-18, 2013. Dead Man’s Eyes is the third of six Universal films starring Lon Chaney, Jr. under the “Inner Sanctum Mysteries” banner. Like many film series of the 1940s the Inner Sanctum grouping was based on a popular radio show, which had debuted in 1941 and ran to over 500 episodes by the time of its final episode in 1952. The radio episodes were based on Simon and Schuster mystery novels, but Universal only bought the Inner Sanctum name, not the stories, from the publisher in 1943. Lon Chaney, Jr., who had established horror credibility in Man Made Monster (1941) before cementing himself as one of the movies' most famous monsters in The Wolf Man later that same year, had since appeared in additional genre titles such as The Ghost of Frankenstein (1942), in which he played the Monster; The Mummy’s Tomb (1942), which saw him as the Mummy; Frankenstein Meets the Wolf Man (1943), reprising his most famous role; and Son of Dracula, as Dracula, before Universal placed him in his own series. The Inner Sanctum Mysteries that Chaney, Jr. starred in between 1943-45 have historically been thought of as inferior to his better known work, though Universal’s 2006 release of all six movies in a single collection reveals them to be fun and fast-paced even if you do consider them simple and routine mysteries. I admire how each entry is mostly distinguishable from the others despite several holdover cast members from one entry to the next. 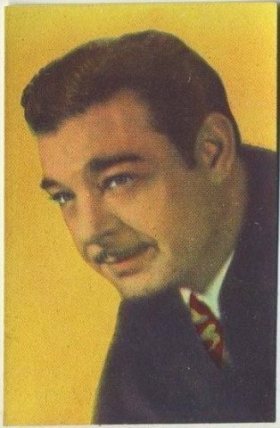 Another Chaney Blogathon post by Kristina at the Speakeasy takes a look at three additional Inner Sanctum titles and provides additional background information on Chaney, Jr. and the series. Read it here. Dead Man’s Eyes features an especially strong cast with Jean Parker as Chaney's love interest; Paul Kelly as his friend, a psychologist; George Meeker as Chaney’s romantic rival to Parker; Edward Fielding as Parker’s father; Jonathan Hale as a doctor; Thomas Gomez as a detective and, though far more alluring than talented, Acquanetta as an artist’s model for Chaney’s lead. Reginald LeBorg directs Dead Man’s Eyes, as he did the previous two Inner Sanctum titles. It would be his final “Inner Sanctum Mystery.” LeBorg soon moved on from Universal to Monogram where he directed several Joe Palooka and Bowery Boys series entries. 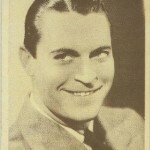 He remained associated with "B" films throughout his career, which included additional genre films and television work throughout the 1950s. 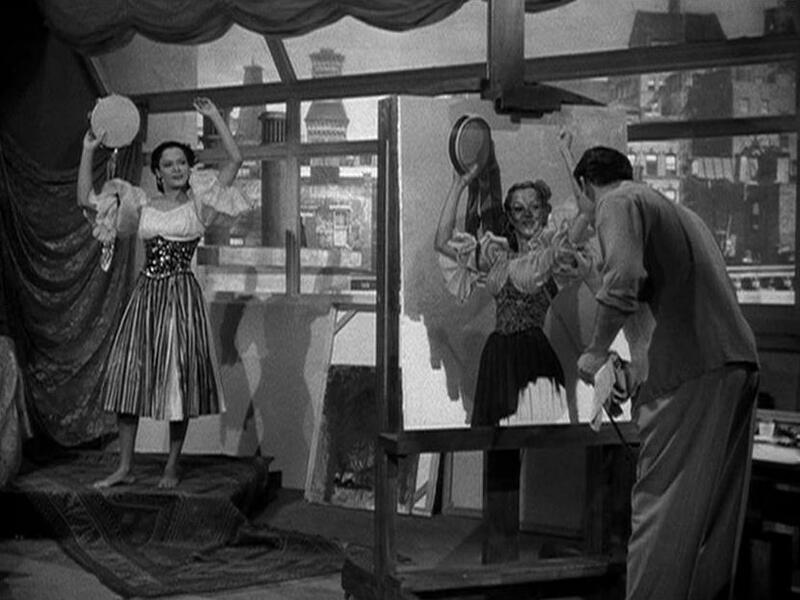 Dead Man's Eyes opens with Chaney’s Dave Stuart completing his day’s work at the easel and dismissing his model, Tanya (Acquanetta), from her pose. 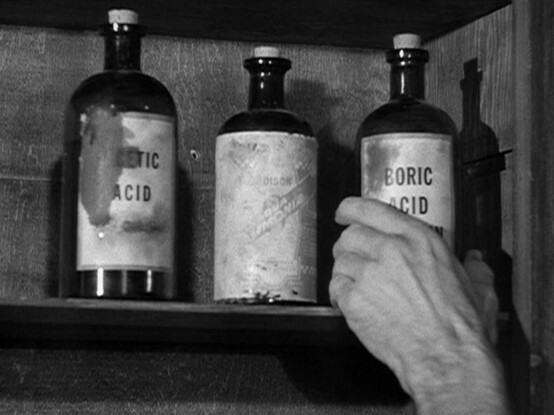 Dave’s eyes are weary so he pats them down with Boric Acid, an eye wash, over by his sink. This seems to be how he routinely ends his day. Other bottles, including one marked Acetic Acid, are shown lined up on a shelf with Dave’s eyewash. Dave’s fiancé, Heather Hayden (Parker), enters while Tanya is off-screen gathering her things to leave. Heather is polite enough to Tanya when their paths cross, but Tanya is distinctly uncomfortable around Miss Hayden. “She’s in love with you,” Heather says after Tanya exits. Dave dismisses the idea and he and Heather have a night out on the town. The next day at the studio Dave’s friend Alan (Kelly) arrives and he quickly establishes that he has a thing for Dave’s model. Tanya overhears the two men talking about her while taking a tissue from the cabinet near Dave’s sink, but unfortunately she doesn’t take enough care rearranging the bottles of various chemicals that she had to move to get at the Kleenex. What comes next is rather obvious and provides the most horrific moment of this mystery as Chaney uses the wrong solution to clear his eyes and is soon tugging on his face and rolling his eyes skyward. After a few moments of monster faces that would make Dad proud, he stumbles to the phone and demands a doctor. Heather, meanwhile, is spurning Nick’s (Meeker) advances when a phone call from the hospital delivers the news about Dave. She and Nick meet up with her father (Fielding) in the hospital waiting room. Dad Hayden, as he is called by everyone, is beloved by all except Nick, whom he despises. It's hard to fathom what everyone else sees in the old man because he’s a crank in every scene we see him in. 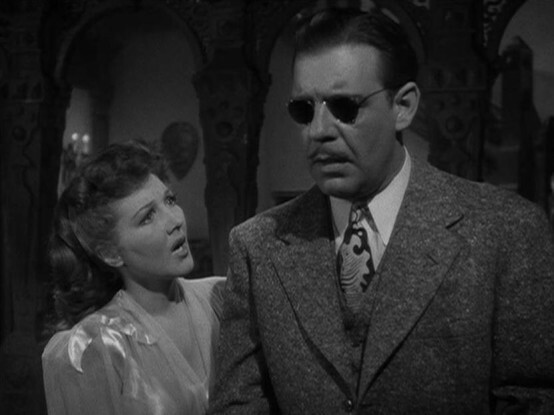 This group is given the bad news by Dr. Welles (Hale): Dave is blind. The doctor offers hope the next day by suggesting the possibility of a corneal transplant to Dave. Dave is horrified by the idea of one of his friends or any other living person donating an eye to him. With the operation seeming a long shot he breaks things off with Heather the next day. Dad Hayden visits Dave to scold him but offers hope when he tells Dave that he has made arrangements with his lawyers to use his eyes for the transplant immediately upon his own death. Things don’t look so good for Dave when Dad Hayden turns up dead. Especially when Heather finds Dave with the body and blood on his hands! We’re about halfway through the movie when Dave has the operation that gives title to the film. Thomas Gomez makes his first appearance as the Police Captain at this time. While the mystery element of Dead Man’s Eyes has been criticized for being too obvious, I thought we pretty clearly had three, even four, suspects throughout most of the investigation. With Dave engaged to Heather, but model Tanya in love with Dave, Dave's friend Alan in love with Tanya and weaselly Nick carrying a torch for Heather, there are plenty of bruised feelings for Captain Drury to sort through. The relationships are further complicated when Dave's blindness throws everything out of balance after he dumps Heather. A spot is open for Tanya and she looks to make the most of it. The movie benefits from the casting of acting pros like Parker, Kelly and Hale, but that doesn’t make up for the pain caused by Acquanetta’s scenes. She’s often paired with Kelly, and you feel for him, but on those occasions she finds herself with Chaney, Jr., Dead Man’s Eyes becomes especially uncomfortable. I love Lon Chaney, Jr. as the dopey everyman. He’s basically still playing The Wolf Man’s amiable Larry Talbot throughout most of Dead Man's Eyes, but when his Dave Stuart is roused towards any emotion except agony, Chaney is, well, agonizing. His Dave is calm and placid but never rises to anger, he just explodes and it doesn’t appear at all natural. Then, rather than cooling off, he immediately reverts to calm dopey Dave. 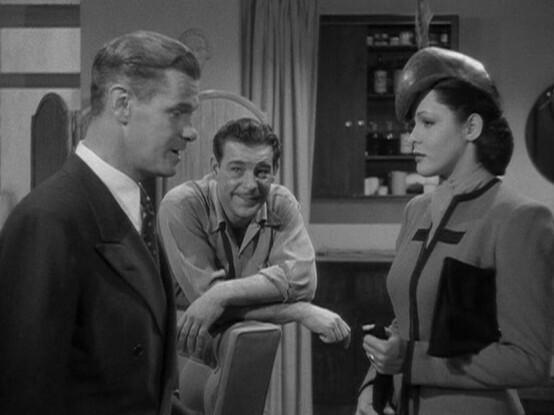 One key scene, in which he snaps at Acquanetta, stands out as particularly terrible as Chaney jumps back and forth between hot and cold with zero warmth and Acquanetta, who simply cannot act, makes a total train wreck out of the scene. Dead Man's Eyes newspaper ad. Found in the Havre Daily News, March 23, 1945. 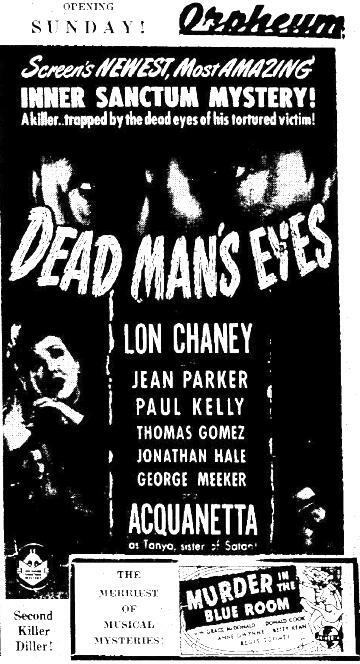 More on Acquanetta to follow, but first I want to wrap up Dead Man’s Eyes. Perhaps you’ll take this as a backhanded compliment, but I enjoy Dead Man’s Eyes as much as any of the other five “Inner Sanctum Mysteries.” By this I mean that I like them all. They are tidy little hour-long “B” pictures each linked by Lon Chaney, Jr. and enhanced by familiar supporting players throughout the series. Because of Chaney and the dark subject material they’re marketed as horror movies, but they are mostly and mainly mystery films. While none of them approaches the top echelon of either genre, each is entertaining and Dead Man’s Eyes--either despite or because of its being one of the most routine--is my own favorite by a slight margin. The last time that I mentioned Acquanetta was in my post about Captive Wild Woman (1943). She purposely has one of the most complicated backgrounds I’ve yet to run across. 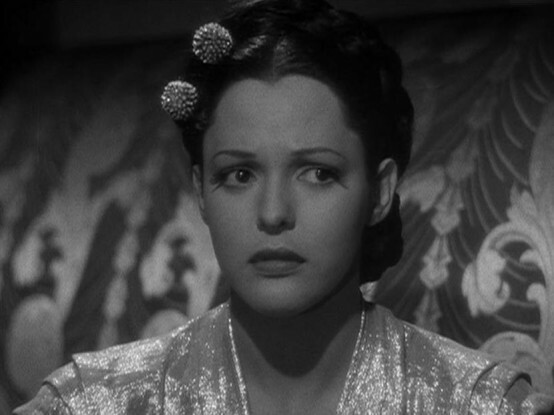 The beauty who burst on the Hollywood scene as the “Venezuelan Volcano” with her screen debut in Arabian Nights (1942) was soon publicly exposed for "hoaxing filmdom" after the Screen Actors’ Guild asked to see her passport and the “Volcano” could not produce one. She confessed that she was actually Burnu Aquanetta, a Native American born in Wyoming. But was she? In the indispensable Universal Horrors the authors quote Captive Wild Woman director Edward Dmytryk, who said that when pressed for her passport it was discovered that Acquanetta was from Philadelphia. Dmytryk said, “After that, rather quickly, they found out she was part-black—which today wouldn’t mean a damn thing. But in those days it still did” (343). The black press of the time, specifically the The Afro-American, rather routinely referred to her as Mildred Davenport and offered the following information when reporting her 1951 marriage to the much older artist Henry Clive (O'Hara): “The actress, a colored American, is a native of Germantown, Pa., who formerly attended West Virginia State College.” Tabloid reporter Cliff Mackay from that same paper added that Acquanetta had previously been married to a wealthy Mexican importer, Luciana Baschuk, and that the couple had one son together. In the mainstream press The Milwaukee Journal exposed Acquanetta in an in-depth piece published in 1942: “Old acquaintances and neighbors began seeing Acquanetta’s picture in print and the little girl with the big imagination was exposed again. She is really Mildred Davenport of Norristown, PA.” Nowhere does the article mention that Miss Davenport is black. Acquanetta, for her part stuck to the story of being Burnu Acquanetta, a Native American, throughout her life. She married a third time to Los Angeles businessman Jack Ross in the late 1950s. The couple moved to Arizona where Ross’ auto business flourished and his actress wife starred in his commercials. The New York Times reported in her 2004 obituary that the couple had had four children. That same Times obituary made no mention of Mildred Davenport. Neither did the United States Social Security Death Index which lists her given name as Burnu Acquanetta, age 84 (1920-2004). Weaver, Tom., Brunas, Michael., & Brunas John. Universal Horrors: The Studio's Classic Films, 1931-1946 . Jefferson, NC: McFarland, 2007. 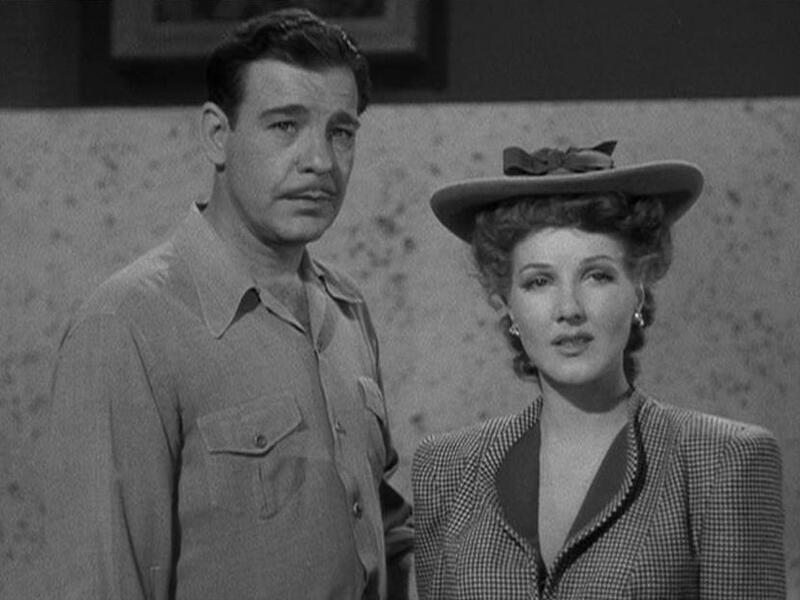 Jean Parker and Lon Chaney, Jr.
Kristina, I agree, usually there are enough positive moments to outweigh the negatives as long as the bad stuff isn’t too bad. In this case the Chaney-Acquanetta moment I detailed above was pretty rough, but making allowances for each of them I wound up getting more out of this title that I expected. PS: Lantern strike again–I think I figured out why Universal just bought the Inner Sanctum name and not the stories from S&S. A 1942 Film Daily note mentions that 20th Century-Fox bought the Inner Sanctum mysteries. Assuming this is correct, maybe Fox got the stories but Universal got the name? I wonder. Good find, that would make sense. Did they end up using any of the stories under a different banner/title? then complicating matters you have that ate 40s Lew Landers Inner Sanctum movie. Kristina, I don’t know, but hunting that info down would prove the idea. My guess is that if they were used in a series we would know, but they could be random “B” movie titles spread throughout the decade. Or they could be stories that were never produced. 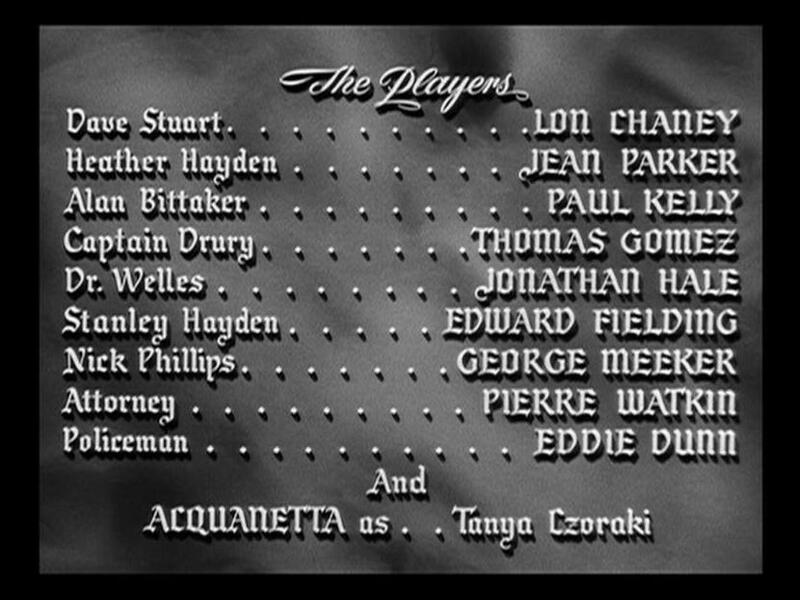 Thanks for the great Inner Sanctum review, the tribute to Lon Chaney Jr and the fascinating tale of Acquanetta (sounds like a hairspray brand to me). I could see a really good biopic being made out her her life. Thank you for hosting! Glad you enjoyed what I put together. Yes, I agree about the hairspray! She’s an intriguing personality whose biographical info doesn’t always match up. I had just mentioned on Twitter the other day that after I picked up the Inner Sanctum set I let them sit for a year or more before I ever bothered with them. Once I watched the first one I was hooked. They’re “B” mysteries that are probably more weird than dark. The entertainment value borders on camp and sometimes crosses that border. But they’re fast and they’re fun and each is different enough from entry to entry to stand alone. The Columbia mystery series like The Whistler and Crime Doctor are better done, but they can blend together at times. 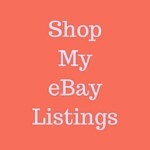 Thanks for reading, I hope you get to check them out! Joe, what can I say, except you said it. It’s hard to completely botch a story in 70-minutes, which may be why I’m so willing to watch titles and genres that I’d never take time to bother with if they had a 21st Century release date and double the running time!